Chaos has Only Just Begun! But it looks like each side still blames the other for what happened! The Trolls are SURE that a Horc Chaos Lord is responsible for this tragedy, and the Horcs - many of them - KNOW that the best defense is a pre-emptive offense. 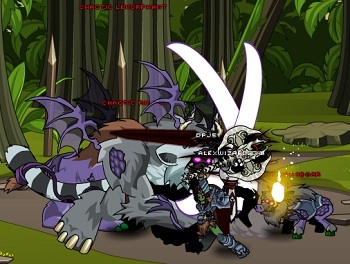 After defeating the Chaorrupted Troll War Boss (this is NOT the Chaos Beast. We are not even close to the end of Bloodtusk Ravine! Muahaha! ), you'll be taken to a screen where you can choose to view the Troll OR the Horc war end cutscene. 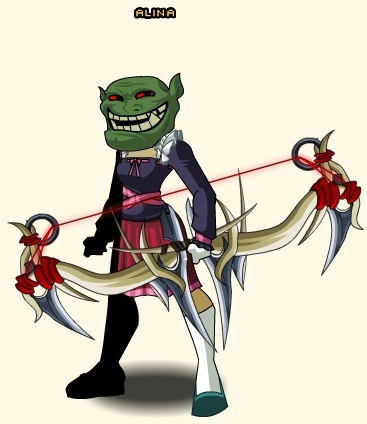 Trolls will see "Chaos Scars" while the Horcs can watch "Chaos Rage"! Both will give you an insight into the characters and what they are planning for the future of their enemies. Log in next weekend to see the VERY unexpected (in that no one's guessed it. Yet...) outcome of the Bloodtusk Ravine war! SECRET: We said the winning side would influence the war boss, and it did! Had the Horcs won, the war boss would have been a Chaorrupted Horc. Zot's little sister. /sadface! It's 3AM and it's time for all good - and exhausted - game developers to head to bed! See you on Monday, Heroes! * Thanks to Tweaked, Zereldo, XXJukkaXX, dark warrior overlord, Omnilordzant, and Kroulo for an EPIC half hour of battling while we raised the war meter that last little bit! Because true heroes like you are commanding the Bloodtusk battlefield! Fighting the Chaos monsters wherever they are found. Paired up in parties of Trolls, Horcs, or just soloing as extraordinary, everyday heroes, you're hack-and-slashing away at each of the war meters! And if you keep pushing as hard as you are, you'll soon find yourselves face-to-tusks with a Chaorrupted war boss that NO one will expect! Trolls should be hitting 50% sometime tonight (they are at 48% now); the war is half-won, but the battling is NOT done! Fighting on the Troll side is ferocious, with artists putting down their paintbrushes and musicians laying aside their lutes to pick up anything with a point to really put it to those twisted jungle terrors! They will not let the Horc Chaos Lord destroy their home! Trolls have turned from ballet postions to battle-stances! Horcs can hit 45% tonight (they are at 41% now) if they continue ripping through the Chaorruption with as much will and stamina as they have shown so far! Battle On, Horcs! Do not let the Troll Chaos Lord take over your land and ravage your people! Your hearts are not made of easily-shattered crystal, no! Embrace the stone-strength that courses through your veins and emerge from the jungle victorious! Using strength and a courage as solid as any stone from their mountain, the Horcs push forward! Talk Like a Pirate Day this Friday! Yo ho, yo ho, a Pirate's gear for me! Quibble is coming back to BattleOn this Friday and he's got bountiful amounts of bad-axe booty and piratical equips for you this weekend! 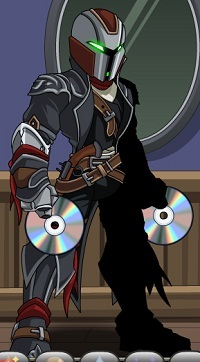 And introducing the newest Talk Like a Pirate Day armor - Shadow Pirate! 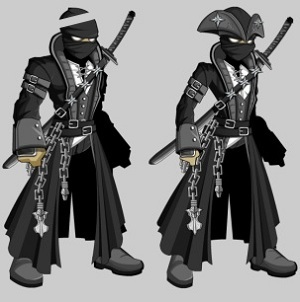 Other armors featured in this year's Talk Like a Pirate Day shop are the Legion Jolly Roger and the Jester of Torture-You-Ga! Pictures of those on Friday! AEXtras is still a great way to get FREE ADVENTURECOINS and even FREE BATTLEON POINTS, and with new Inventory, Bank slots and Premiere Event rares to buy there's never been a better time! The river runs red for both Trolls and Horcs! Chaos and paranoia have infected the residents of Bloodtusk! There is no chance of peace now; not when the Trolls fear a Horc Chaos Lord is attacking them and the Horcs fear a Troll Chaos Lord is determined to crush them! Each side wants YOU to battle alongside them to save their home and keep their people free! Grab your sword, equip your stoutest armor, and bring a BIG backpack because there's a LOT of loot to grab! The boss battle will be determined by the intensity of the fighting. There is no telling what vile creation this mysterious Chaos Lord is planning for the end of the war, but you can bet he is waiting and watching... he will choose whatever hurts you the most! TWO AC Rare shops and TWO war merge shops! 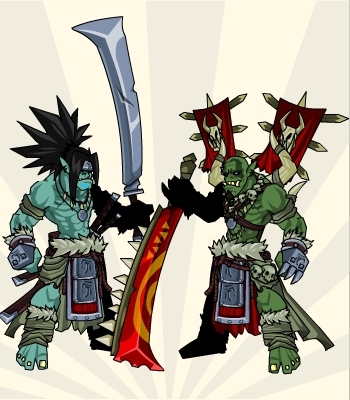 Both AC Rare shops will disappear once this epically divisive war event is over, so get your gear while you still can! The merge shops (and the merge shop drops) will continue to be available once the war is over. The war itself is permanent content. Cysero says: Members get your Keys! If you haven't heard about the new Treasure Chests, here is how they work: As you adventure you might find a Treasure Chest that can only be unlocked by Twilly in BattleOn by using the Magic Treasure Chest Keys that he sells. Each chest contains a random EPIC item! As a AQWorlds Member, Twilly will give you TWO FREE KEYS every month for the duration of your membership! Except last month when a small bug caused most Members to get a LOT of free keys. Members, the time has come for you to claim this month's keys for yourself! Simply follow that button, Complete the quest given to you and just like that... 2 more Magic Keys! This only the lastest in and increasing list of AQW Member Benefits! This Free Keys quest resets on the 1st of every month but you can complete it for your free keys at ANY TIME during the month for as long as your membership lasts. Just don't forget to visit Twilly at least once a month. If you skip a month, you miss out on your two free keys! I don't think that remembering will be a problem considering that we have been and will continue to add new items all the time including TODAY! Remember that they are all set to a cost of 0 AdventureCoins so you can store them for free in your bank (like all AC items) and the keys are only 200 Acs so you can easily complete an AExtras offer for another key! Happy adventuring and if you find a Treasure Chest... good luck! Yarrrrrr! It be almost Talk Like a Pirate Day in these here parts! On September 19th, all you landlubbers will have to find your sealegs, because we're going dubloon-or-nothing with this year's TLaPD rares! Mennace has made a whole hull's worth of the saltiest loot in the land! 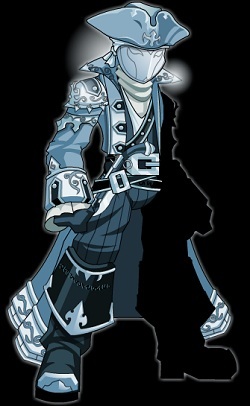 And Dage's Platinum Naval Commander will have all you lily-livered scalawags full-blooded pirates before the day is done! The Brasilian Independence Day shop will remain until Monday! Get your gear while it's still here! Back from Con and busier than ever! We are back from Dragon*Con! Thank you to all of you who came to see us, it was SO COOL to get to meet you all, and hear all your excellent (if occasionally unfeasible) suggestions! 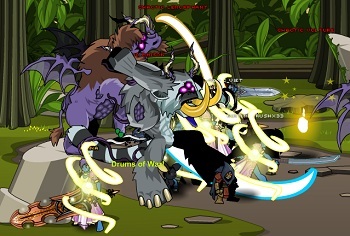 Artix is going to write a BIG post about all the AWESOME events that happened at Dragon*Con this weekend, but right now we're going to fill you in on what will happen this week in AQWorlds. We've got a LOT planned and very little time to do it. So lets get started! Two races. One land. A recipe for WAR! If you've been keeping up with what's happening in Bloodtusk Ravine, you'll know that there is an uneasy peace between the Trolls and the Horcs. Not all of the Trolls and Horcs are for a truce, though, and when Chaos rears it's divisive head this week, the ravine's river will flow with more than just water: it's not called BLOODtusk for nothing! Brazilian Independence Day Shop comes tomorrow! Obrigado, Brazil! (That's the only Portuguese word I know. How do you say "Happy Independence Day, Brazil!" and "Enjoy the epic rares!" Someone let me know! Those online translators make mistakes sometimes.) We've got some awesome holiday rares coming your way to celebrate Brazilian Independence Day! If you live in Brazil (or just think the colorful items they've inspired are awesome), then you'll want to check out these celeb-rockin' items! Pictures will come tomorrow once the shop rolls live since Samba is working on schoolwork and recovering from Con today. Many people on Twitter are asking "Why do Brazilian players get a shop for their Independence Day and not (their country)?" Our answer to that is: Brazil has one of the largest (and friendliest) numbers of AQW players in the world. This is just a way to say "thank you" to the entire nation of Brazil for their overwhelming enthusiasm for AQWorlds! SO many of you Members are flooding us with requests for your two free Treasure Chest keys. We want to give them to you, as well! And we will, just as soon as the code to do it gets written up. What we've realized is that it will be easier to have a monthly member-only quest which will give the keys as a reward (a quest like the treasure chest turn-in). Once we get that set up, you'll be able to get your two free keys. If you attended Dragon*Con and saw us at the Panel, fan table, or just wandering around, then you probably got your name on the list for a Dragon*Con pet! 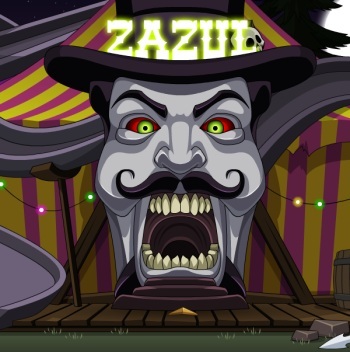 (And really, who wouldn't want a chibi, candy-throwing Zazul pet?) MOST of the people who wrote their account names down on the list have received a "DragonCon Not-Yet-Pet" item which will turn into the REAL pet once Dage finishes making it. Like this, but chibi. And with more candy. However, there were some people who wrote the wrong information down, or whose handwriting got blurred. If you don't have your D*C placeholder item in your inventory yet, please let me know on Twitter or by contacting Customer Support (though Twitter will probably be faster). We have a list of names to check against and ways to match your info, so attempts to sneak onto the list will be met with gentle laughter and a "Sorry!" 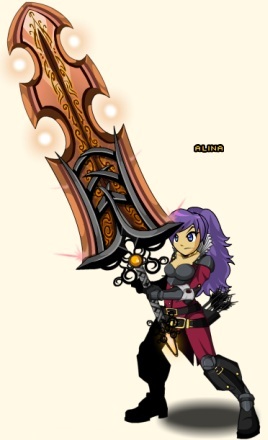 A BIG dragon requires a BIG blade! 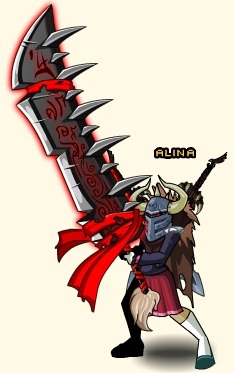 You might also have seen some people with a Dragon Khan blade in their inventory. You DON'T need to have gone to Con to get this crazycool modified DragonBlade! 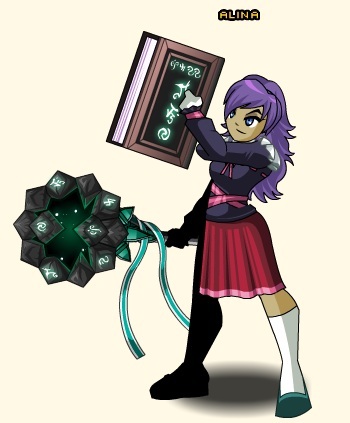 So long as you can get the code from someone who has it, you can use it to unlock Valencia's shop and wield one of your very own! AQW's third birthday next month! CRAZY! AQWorlds' third birthday is in a month, and so is Third Upholder (with the attendant gift-badges and loot galore!) We're starting to plan out what we want to do for it, but what would YOU like to see happen? Look for Artix's crazily-detailed (and sometimes hard to believe) Design Notes post about everything that went on at Con later today!